President Trump spoke Tuesday at the White House. WASHINGTON — Before his recent turn to politics, President Trump made his name selling things: Real estate. Steaks. Dreams of sudden, easy riches at the craps table. Himself. Now comes an extreme test of his salesmanship: Convincing the American people that big tax cuts for giant corporations really means more jobs and higher wages for middle America. Trump’s tax cut plan sounds a lot like what has been known since the days of Ronald Reagan as “trickle-down economics” — the idea that putting more money in the hands of those at the top will unleash a wave of economic growth and indirectly spur prosperity at all strata of society. Many economists and other critics say there’s little evidence tax cuts have ever done this, despite multiple attempts over the decades. The sales job begins in earnest Wednesday. Trump is scheduled to talk up his plan on a trip to Indianapolis, part of the Rust Belt where his campaign promises of an industrial revitalization resonated strongly last year. Details are expected to be unveiled by key GOP negotiators back in Washington — including the size of the tax cut for US corporations. Early indications are that Trump and lawmakers want to slash the corporate tax rate to 20 percent from its current level of 35 percent. Ground Game: Will Puerto Rico be Trump’s Katrina moment? 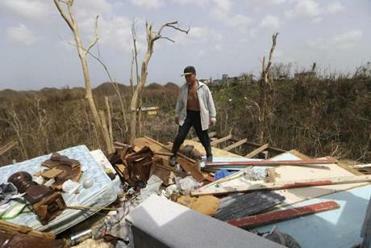 The US territory is facing the ugly aftermath of natural disaster, and some have criticized the president for what seemed to be a lackluster response. The White House offered a preview this week. “These cuts and reforms will deliver massive job creation and economic growth,” White House press secretary Sarah Huckabee Sanders said Monday. And Republicans increasingly look to be counting on that growth to pay for most of the cost of the tax cuts. While GOP leaders had initially vowed to make sure their tax overhaul did not add to the budget deficit, they’ve backed off that goal in recent weeks. Senate negotiators signaled their bill could add as much as $1.5 trillion to the debt, but countered with arguments that tax changes could spark enough economic growth to offset that revenue loss. Critics contend there’s no proof — historical or otherwise — that big tax cuts for corporations will produce sustained economic growth or other direct benefits to average working folk. 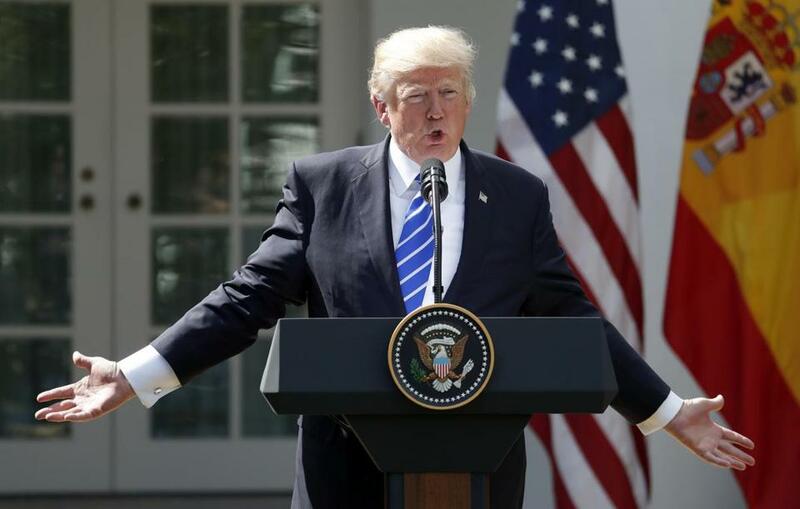 “In a Trump administration where everything else is unconventional, the tax policy is really bread and butter supply-side, trickle-down, same-old, same-old Republican tax policy,” said Bill Gale, codirector of the nonpartisan Tax Policy Center. Polls suggest Trump and congressional Republicans have a tough task convincing voters otherwise. Fifty-one percent of US adults believe Trump’s tax plan will benefit the richest Americans, the latest Washington Post-ABC News poll found. Most people — 65 percent — also say big corporations don’t pay their fair share in taxes under the current code, the poll found. That will bolster Democrats who argue that corporations will keep tax savings as profits or plow them into dividends for stockholders. The debate about taxes and economics will unfold over months and could jump into 2018, denying Republicans a much-needed quick win after their serial failures to pass a repeal of the Affordable Care Act. The tax debate has yet to begin in earnest because of a lack of detail. That will start to change Wednesday. The GOP blueprint may propose dropping the top rate for the wealthiest Americans below where it is now, at 39.6 percent, to 35 percent. Republican tax writers also are promising benefits for average Americans, including “a dramatically simpler tax code for families, so much so that nine out of 10 Americans will be able to file with a simple post-card system,” Ways and Means chairman Kevin Brady of Texas told reporters Monday. Leaked details of the framework agreement suggest he’s talking about plans to reduce the number of tax brackets from seven to three, and almost double the standard deduction to $12,000 for single filers and $24,000 for married couples. The White House contends the president’s approach would boost annual economic growth from 2 percent to 3 percent, or more, create 12 million new jobs, and boost now-stagnant wages. But even conservative economists say it is impossible to generate that level of economic growth through tax cuts. “I think they should be extraordinarily pleased to aim for half a percentage point, and they might not get that,” said Douglas Holtz-Eakin,who served as chief economic adviser to John McCain’s 2008 presidential campaign. Still, Holtz-Eakin and some other tax experts say a well-designed tax code overhaul, with a focus on the corporate side, could help US workers by spurring economic activity. The United States has the highest corporate tax rate in the world. Some observers point out that many big US companies effectively pay much lower rates thanks to myriad benefits and loopholes. But Scott Greenberg, a senior analyst with the conservative-leaning Tax Foundation, said studies have shown that the high US corporate tax rate still discourages companies from making what economists call “marginal investments” — building an additional factory or buying more equipment — beyond what they already have. Perhaps even more powerful is the “full expensing” provision being eyed by the GOP, Greenberg and others say. Now, companies can deduct ordinary business expenses — like the cost of postage, or air conditioning — from their taxable income. But when it comes to big investments like building a new warehouse or buying new equipment, companies can only deduct the expense over the course of several years or even decades. Under “full expensing,” the GOP would let companies deduct those costs the year the money is spent. But there are plenty of other tax analysts who say the GOP pitch is nothing more than wishful thinking, a convenient way to sell a policy that won’t provide much benefit beyond more cash in the pockets of corporations, their investors, and other rich folk. “This isn’t ‘tax reform,’ it’s just a big giveaway to millionaires and corporations, and it won’t ‘trickle down’ to the rest of us,” said Frank Clemente, executive director for Americans for Tax Fairness, a liberal-leaning advocacy organization. “The evidence is not favorable to the idea that you are going to get much of a growth boost out of this,” said Gale of the Tax Policy Center. In a recent paper, he reviewed evidence from past federal and state tax cuts, as well as international tax code changes, and concluded with his coauthor that tax cuts didn’t do much to boost growth, especially beyond a short-term window. What’s more, funding tax cuts with deficit spending tends to lead to slower, not faster, economic growth, he said. Economic growth following the 2001 tax cuts under George W. Bush was pretty anemic. While the economy grew after the Reagan-era cuts, numerous economists have attributed that growth to the Federal Reserve cutting sky-high interest rates. Some tax analysts counter that Bush and Reagan tax packages are not illustrative examples of what major changes on the corporate tax side could do for the economy. The Reagan cuts focused on financing a significant deduction in individual tax levels with raising taxes on corporations, said Holtz Eakin. And the Bush cuts were likewise focused mostly on individual taxation, not on economic growth, said Greenberg of the Tax Foundation. “We haven’t totally really seen a tax reform plan that passed the United States Congress before that has been designed with an eye toward economic growth,” Greenberg said.